Pendulum length 65cm. Cable & Weight Drive. Chimes the hours on a coiled gong. Movement: Kieninger LSR 02 - 65cm PL. Gongs: 50 mm polished brass bell mounted on the rear of the movement. The LSR 02 movement specifications. Plate size 100mm x 85mm x 1.7mm with 4 bronze bushes. 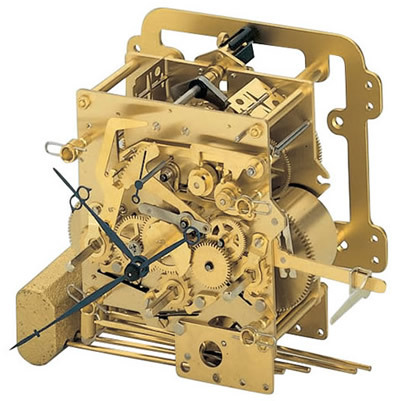 the patented Kienirramic& solid anchor Dead Beat Graham escapement, Automatic tick (beat adjustment, Chime silencing and front Winding through the Dial. The movement chimes the hours and strikes a single chime on the half hour on coil gong. This movement set requires a minimum measurement of 108mm from the front of the hand-shaft to the inside of the rear panel, the pendulum with a 140mm diameter bob swings approximately 190mm. To achieve eight-day running the weights drop 730mm measured from the hand-shaft to the bottom of the case. The distance from the hand-shaft to the bottom of the cabinet needs to be a minimum of 420mm to achieve eight-day running. The distance from the rear panel to the front face of the weights is approximately 135mm. The Dial, Hands and Movement are supplied assembled and ready for mounting on your support board - you need to drill three holes in the rear board using the template provided and the chimes can be easily mounted using the special bolts included in the set. Click here to view the Set 16 Movement Dials and Pendulums images page. Click here to view the Set 16 Options and Prices page. Movement: Kieninger PS 055 - 65cm. Automatic Night Silencing. Pendulum: Timber shaft with a 140mm polished brass bob. The movement specifications. Plate size 114mm x 99mm x 2.0mm. 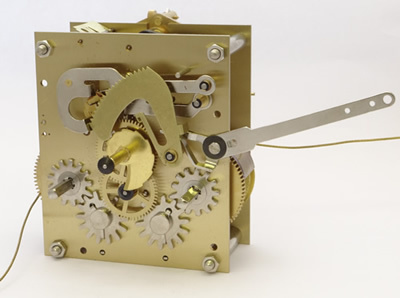 A dead-beat Graham escapement, Automatic tick (beat) adjustment. A pendant allows you to select Automatic Night Silencing (10PM until 7-15AM), Continuous Chiming or Silent. The PS 055 movement chimes the hours and strikes on the half-hour on a coiled gong. The PS 65cm movement with a 20cm dial requires a clock cabinet internal height of 885mm, a width of 205mm and a depth of 123mm measured from the front of the hand-shaft to the rear panel. The distance from the hand-shaft to the centre of the pendulum bob is 570mm and a 140mm diameter bob will swing about 205mm. To achieve eight-day running the weights need to be able to drop 760mm, measured between the centre of the dial and the inside bottom of the cabinet. The distance from the rear panel to the front face of the weight is approximately 110mm. Click here to view the Set 17 Movement Dials and Pendulums images page. Click here to view the Set 17 Options and Prices page. Pulleys: Small brass Cable Pulley for P & R movements. The movement specifications. Plate size 114mm x 99mm x 2.0mm. Fitted with Maintaining Power, a dead-beat Graham escapement, Automatic tick (beat) adjustment. A pendant allows you to select Automatic Night Silencing (10PM until 7-15AM), Continuous Chiming or Silent. The PS 063 movement chimes the hours and strikes on the half-hour on a coiled gong. 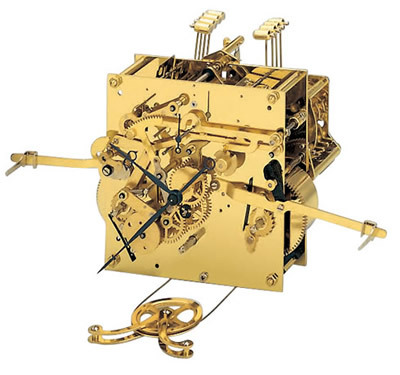 Click here to view the Set 18 Movement Dials and Pendulums images page. Click here to view the Set 18 Options and Prices page. Dial: Oakside 200mm diameter white Regulator dial (including hands) with black Roman numerals, two subsidiary dials show the hours and seconds and finished with a brass rim. Click here to view the Set 20 Movement Dials and Pendulums images page. Click here to view the Set 20 Options and Prices page. Pendulum length 65cm. Spring & Cable Weight Drive. 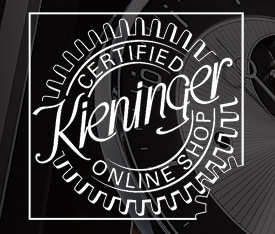 Movement: Kieninger RWS 13 - 65cm. Gongs: 8-rod gong - 430mm for RWS. Mounting: Brass satin finish bracket. The RWS 13, 65cm movement with a 20cm dial requires a clock cabinet internal height of 885mm, a width of 205mm and a depth of 135mm measured from the inside face of the dial glass to the rear panel. To achieve 8-day running, the weights need to be able to drop a minimum distance of 760mm, measured between the centre of the dial and the inside bottom of the cabinet. The distance from the hand-shaft to the centre of a 140mm pendulum bob is 532mm and it will swing about 195mm. The distance from the rear panel to the front face of the weight is approximately 120mm. The Dial, Hands and Movement can be supplied assembled and we will attach these items to the movement mounting bracket, if it is ordered. 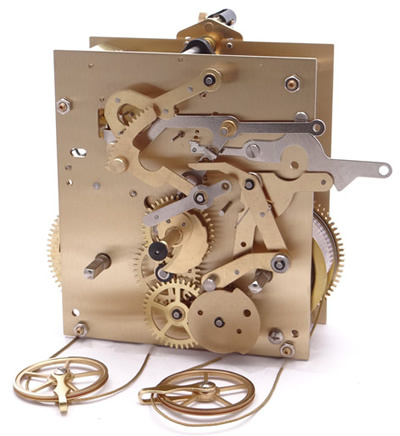 We also provide a template so that you can easily drill the seven holes in the rear board and the movement & chimes can be easily installed in your clock using the special bolts included in the set. Click here to view the Set 22 Movement Dials and Pendulums images page. Click here to view the Set 22 Options and Prices page.